Google will show different results which differ based on your search topic. Look for a location, and Google will likely return a Google Map entry as the first result. Search for a hotel or vacation, and Google will serve up an ad and try to get you to book your trip through a partner. And if you type a math problem into the search bar, Google will solve it for you. 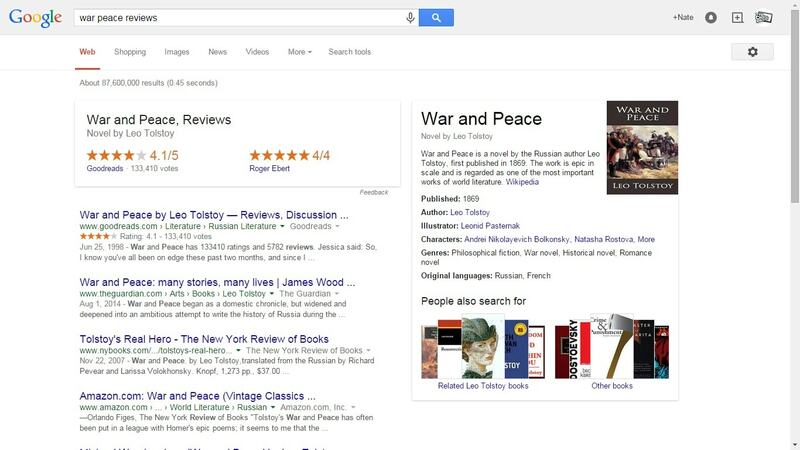 Google is taking the reviews which it used to display to the right of the search results and is putting them before the organic search results. The reviews have been aggregated from Goodreads, B&N, Google Books, Amazon, and other sites, and link back to those sites. I can't tell you how long Google has shown reviews this way; it is new to me, and from the way that Search Engine Roundtable reported on it yesterday, I think they are only seeing it for the first time as well. In fact, this is so new that I don't think anyone has realized that Google is mixing together reviews for several types of content. Did you notice that the second link in the screenshot above leads to a movie review, while the first leads to a review of the book? Yes, Google is aggregating reviews for several formats into that one window. I'm not sure that is a good design, but I can tell you that adding either words like book or movie to the search terms will filter out the extraneous reviews. Curiously, that review window is not shown when you search for gadget reviews, but I would not be surprised if Google made it more widely available at a later date. I wonder if that’s what the publishers would want? Or their readers? Unless I stick the word “review” into the search box I’m looking for a direct link, not ways for google to make money.